At 32” x 20” you have a medium mat sized to fit your entire torso or legs or target specific areas of your body. In the top layer, stones are held in place with silicon glue. The glue conducts heat and transfers it very well to the stones resulting in higher negative ion levels. The glue will keep the stones in place for decades. The downside of the glue is the possible need to let the mat air out for a few hours before initial use. 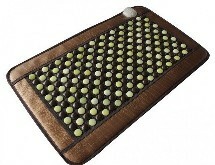 This mat has the ideal combination of both tourmaline and jade so you get to enjoy the benefits of both instead of having to choose. Tourmaline has the highest level of negative ions, with slightly lower levels of far infrared. Natural tourmaline is physically similar to charcoal so it cannot be used in its natural state. We crush tourmaline and mix it with ceramic to make tourmaline ceramic. This way it is sturdy and the process also increases the negative ion output. Tourmaline is known to have an energizing effect. Jade is somewhere between the soothing amethyst and the energizing tourmaline. Natural jade is polished and an ideal size is used on the mats.